Small groups are taking the mannequin challenge. Many have been doing it for years. This may be the latest cultural fad, but it’s nothing new for many small groups, and the church as a whole. Several years ago I wrote about the difference between dead and fully alive small groups. (Read it here.) I also wrote a post about “Mannequin Small Groups, which I decided to revise and repost; it’s more apropos now than ever! The problem is that some small groups were never alive in the first place! My friend Carl Douthit once described these groups as mannequins. They were not created with the intention of being alive, growing organisms. They study the Word only for knowledge, not to put it into practice. They are “all dressed up with no place to go”! Mannequin group leaders and members say they cannot understand why they need to invite new people into their groups or share leadership with a core team or do anything outside of their normal agenda. These groups were not founded with the expectation of being more than “Bible studies,” so they are, as Carl would put it, mannequins, which look good on the outside, but with no life inside. Mannequin small groups are great at standing still, but Jesus gave us a mission to “GO”! Mannequin small groups are posers. They pretend to follow Christ, but they are unmoved by what and whom Jesus loves. They stand still in the middle of the great needs of lost, hurting people around them. What do you do if your small group is a mannequin rather than missional? First, you need an infusion of life that can only come from Jesus. 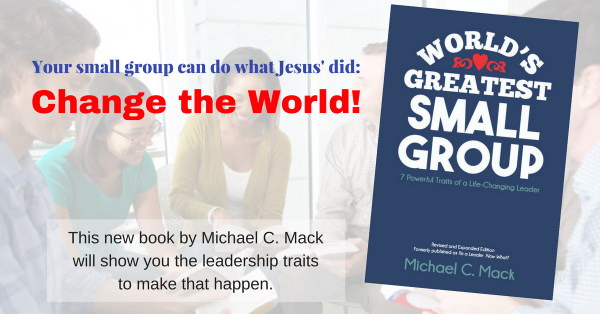 The first Vital Sign of a Healthy Small Group is that it is Christ-Centered. When Christ is really at the center of your group, you meet together in his presence, for his purposes and under his power, and that makes ALL the difference! Jesus is the Resurrection and the Life, so he can bring life to your mannequin-like existence. He is the Way your group should go. He is the Truth your group needs in order to be real and authentic. He is the Life your group needs to animate and invigorate and motivate and activate your group! Second, you need to recovenant with your group. The fourth Vital Sign of a Healthy Group is that it has goals and plans. It’s time for you to confront the brutal facts of your current existence, as Jim Collins puts it, and then decide as a group about what God is calling you to be (your vision) and do (your mission). Note: A Christ-centered group focuses on what God, not individual members, want the group to be. This is the difference between Christ-centeredness and self-centeredness. I could discuss more things your group could do to move from mannequin to missional, but this is probably all you can do for now. Each of the seven healthy indicators I discuss in Small Group Vital Signs will help you move toward missional. A healthy group is a missional group! What score would you give your group? Please respond by scrolling down and commenting or asking more about moving from mannequin to missional.